Book One comes to a close. Taking a little break to think over the direction of the book. Lots of ideas, but which ones to use and how to use them is the hard part. Hope you are enjoying the story. Trouble is coming for Karl. I guess after doing a few pages so fast, I had to burnout. This page is the second or third attempt. Few times erasing, ripped a page in four pieces. I know I should be working from a plot or sketches. What fun is that? This way I make up the story as I go along. Depending on who I talk to or what I see may influence that page that day. Example is the Swing with Scooter reference. Tom Yeo mentioned something about Millie The Model. Never read that book, so I used Scooter instead. I was planning on colouring all the pages with markers, but ran into a few issues. So the colour will have to wait for awhile longer. Markers, paper, scanning and editing do not seem to want to play nice. Markers are difficult to work with, but love markers! Not giving up yet, just putting it aside for a brighter day. 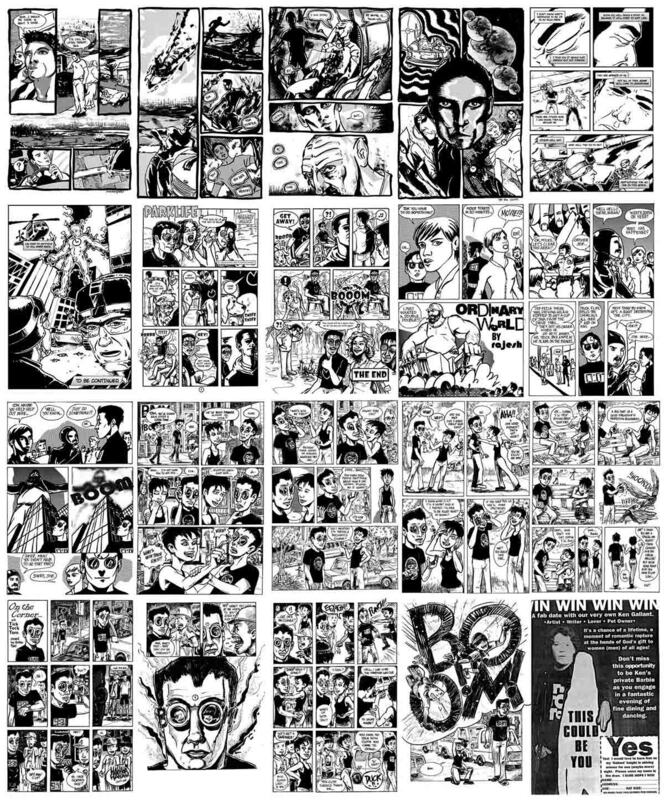 Future pages that are in the stages of being inked or have been by now. Working away on this new page is fun, but taking way too long. This and 2 other pages to go and we come to the end of chapter one of Karma Komic. As you can tell I like The Flash. My memory is going, but one of the very first comic books that I ever got was this Brave & the Bold. It had Jim Aparo doing the art. Loved the scene where The Flash while carrying Batman vibrates through a wall to get into the disco club. Crisis on Infinite Earths was just great for a geek like me. It had every superhero that loved in it! I was huge DC fan. And what made this even better was it had my favourite artist doing the pencils, George Perez. To this day still love his work. I remember buying this book on the newsstand. With the newsstand you had no clue to what was going to happen with the next issue. So when each issue came out I was in a huge shock just by looking at the cover. So when issue 8 came out, I did not know what to do. In the previous issue they had just killed off Supergirl. Who cares, it was Supergirl. Issue 8’s cover need no explaining, I knew what was coming at the end of the issue. It was a great story. Great way for a hero to die. The Flash comic book, written by Cary Bates and pencilled by Carmine Infantino. There was a love and hate relationship at this time with Infantino’s artwork. I did not hate it, yet there was something to it. Those square jaws and wavy hair on everyone. Took me years to realize that he was a very gifted artist (same way people see Picasso when he started doing cubism). Jack Kirby is another one (this is a story for another time). Now I tend to look at his early Flash stories for inspiration. By the way, when I mean The Flash I mean Barry Allen. So far love the TV show. 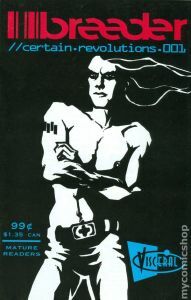 Suicide was a mini comic that was produced by one Ken Gallant. Ken started this in his early years at the Ontario College of Art & Design. It featured stories and artwork from some very talented people. I did a few stories here and there. Suicide took us on a journey into the world of horror. A book not for the weak hearted. And again more samples of what’s to come… this page will become a collector’s item! The famous Ken Gallant first appearance! Breeder was a comic created by Alan Hagen, Patrick Pautler and Dave Perry. The current series lasted for 3 issues. Alan and Patrick did the artwork on the books. I was asked to help out in few of the issues with some inking and pencilling. It was tons of fun working with these guys. Also more samples from a page that is coming soon…. ties into Breeder and its creators. More work in progress. Coming soon. Waiting for a few more pieces of artwork from people. It was the early 1990’s. Just after Paul Marhue, Michael Korditsch, Ken Gallant and I put out the last issue of Kuhlbox with few other guys, I decided to do another book. With the help the fellows mentioned, Tick Tock Tom was produced. Got a bunch of guys I went to college with and asked them to do a story/art on the main the character. One thing I do recall now is that I forgot to tell them to keep the costume same for the character. First issue’s cover was by Michelle Reardon. Paul Marhue came up with the Tick Tock Tom logo. 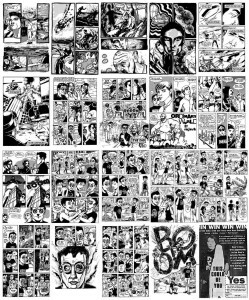 As time went along more people were interested in doing work for the book. Tick Tock Tom lasted for 12 issues and one annual. Over the 12 issue run we must have had over 20 + people doing work on the book. Thank you all for the great experience!! Loved every bit of it. Little Grace came out in 1991. The handy work of one Joseph Nanni. Joseph put out two issues of this book. And also put out a self-published book called Here. Still have all of the Here books also, Joseph. Great work! The books featured work by Nanni, Alan Hunt and a guy named Jay Stephens. Joseph introduced me to many great comics and artists. One which has become one of my most admired artist of all… Jamie Hewlett! more samples of what to come…. Paul Marhue’s sketch for a 2 pager he is doing for Karma Komic. This is what the thinking process is all about. Let us step into the mind of Mr. Marhue. This page I just could not get right. Tried and tried. Erased like hell. Then threw it out. This is where walking away or playing the Xbox comes in handy. Peter Macchione is also helping me out a story-within-a-story for Karma Komic. Peter and I have worked together on way too many stories. So many to list or remember. Check some of them out at tictoctom.com. Page one of two. Enjoy. Here is the problem. Blank page. Working on a side story for Karma Komic. Need a break from the main story. Now this is a problem most artist come across. A blank canvas. Hundreds of ideas going through your head, but what to put down is the hardest part. How to put it down? Trust me this page later has so many eraser rubbings on it. I know what I want to draw. I can’t get my pencil to do what I want to. I stare at the page. Then look over and grab the Xbox controller. Play a game or two of MLB2k13. I have me as a player on a minor league team that is trying to break into the big leagues. I did hit a grand slam once! Yes! Spring training played for the Blue Jays. No luck, I was sent back to the minors. Keep trying. This is my second season on the team. Oh wait… the page… maybe tomorrow. Need to walk away from it. Think about it tomorrow. Did end up rough pencilling the page out (see 2nd post below this). My good and very creative friend Tom Yeo is helping me out with a story within a story for Karma Komic. Tom is writing and drawing this 4 page story. Coming soon. For more of Tom Yeo’s work check out tictoctom.com.